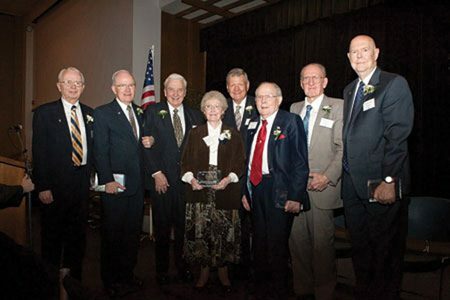 Recipients of the 2010 emeriti awards include (from left) Richard J. Galbraith, John K. Carmack, Vern M. Tueller, Shirley Oscarson, R. Don Oscarson, Glen R. Stubbs, Donald F. Gardner, and Reed M. Izatt. Eight individuals have been honored with emeriti awards by the BYU Emeriti Alumni Association. Recipients are Elder John K. Carmack (BS ’55), Salt Lake City; Donald F. Gardner, Provo; Richard J. Galbraith (BS ’54), Sandy, Utah; Reed M. Izatt, Provo; Vern M. Tueller (BA ’50), Provo; Glen R. Stubbs (BS ’57), Provo; and R. Don (BS ’54) andShirley Oscarson, Scottsdale, Ariz. When President Gordon B. Hinckley considered a new program to bring hope to impoverished young adults throughout The Church of Jesus Christ of Latter-day Saints, he looked to Elder John K. Carmack to help with his initiative. In 2001 Elder Carmack became the first managing director of the Church’s Perpetual Education Fund, which has helped about 40,000 people around the world. Elder Carmack, an emeritus member of the First Quorum of the Seventy, is also an attorney, author, teacher, and community leader. Gardner is a model of organization, thrift, and industry. He has the ability to make do with anything and fix almost everything. He gives of his talents freely, and many have benefited from his service. After 41 years at BYU, he retired as director of auxiliary maintenance. Gardner helped build the auxiliary maintenance program from the ground up with university administrators Fred A. Schwendiman and Ben E. Lewis (BS ’40). He has had as many as seven callings in the Church at once and has assisted in multiple humanitarian projects. A distinguished leader in health care and health insurance, Galbraith pioneered the administration of company-controlled health plans with his partner, Melvin C. Green (BA ’54). Today many large employers use the self-administered health programs Galbraith and Green pioneered. Among his recognitions was having a Salt Lake City health clinic named after him. He has served actively on many boards for Intermountain Healthcare, culminating in his service on the corporate board for 12 years, four years as chair. Additionally, Galbraith has been involved in the entrepreneurial education effort at the Marriott School of Management. Izatt, who joined BYU’s faculty in 1956, is an accomplished chemist whose landmark research and teaching are recognized internationally. A recipient of the American Chemical Society Award, Izatt and his BYU colleague, the late James J. Christensen, established the International Symposium on Macrocyclic Chemistry in 1977. For nearly 30 years he was chair of the meeting’s steering committee and still participates in long-range planning. He was on the BYU chemistry faculty for 37 years, and he and his colleagues established a world-class research program in calorimetry and complex ion chemistry. Tueller enjoyed dual careers as a dentist in Concord, Calif., and an educator at the University of California at San Francisco (UCSF), where he was a department chair for 20 years. He was voted most outstanding UCSF teacher several times and was a graduation speaker two consecutive years. The Academy of LDS Dentists honored him with its Distinguished Service Award, and the UCSF Dental Alumni Association dedicated its 109th scientific session to him for his commitment and devotion to its alumni association. He also served as a visiting professor at the University of Indonesia Dental School in Jakarta. Don and Shirley Oscarson have made considerable contributions to BYU, having served on the BYU alumni board, the President’s Leadership Council, and the College of Fine Arts and Communications Volunteer Leadership Council. They are also members of the Jesse and Amanda Knight Society and have helped nearly 150 fine arts students transition to the professional world through the Oscarson Discovery Grant. Don was senior vice president of marketing for Kohl’s department stores and wrote the City of Joseph pageant in Nauvoo, Ill., and the book Traveler’s Guide to Historic Mormon America. Shirley has sung with the St. Louis Symphony Chorus and has assisted with regional opera companies.